The US has led a coalition carrying out air strikes against jihadist groups in Syria since 2014 but this is the first time it has targeted government forces. Russia and the world is starting to react. Russia has reacted angrily after the US launched a missile strike on a Syrian government air base. US officials said the base had been used to launch a chemical weapons attack in north-western Syria that left dozens of civilians dead on Tuesday. But Russia, which backs President Bashar al-Assad, condemned the US strike and suspended a deal designed to avoid mid-air collisions over Syria. It is the first direct US military action against Syria’s government. At least six people are reported to have been killed. It comes just days after some 80 civilians, including many children, died in the suspected nerve gas attack in the rebel-held town of Khan Sheikhoun in Idlib province. The Syrian opposition and Western powers say the Syrian government launched the attack but Syria denies this. Cruise missiles fly low and have a relatively small radar cross-section so they are difficult to destroy with air defenses. Russia may seek to improve Syria’s surface-to-air missile system in the wake of this US attack but it would be very much a case of shutting the stable door after the horse has bolted. Syria used to have a highly effective national air defense system based on Soviet-era radars and missiles but it has been significantly weakened in the wake of the civil war and the loss of territory by the regime. Look at the ease with which the Israelis carry out strikes against Hezbollah arms convoys and weapons stores in Syria. Russia has some of its most modern surface-to-air missile systems at its air base in Syria and radars with a huge reach but, for whatever reason, they too have not deterred Israeli strikes. What has the US done? 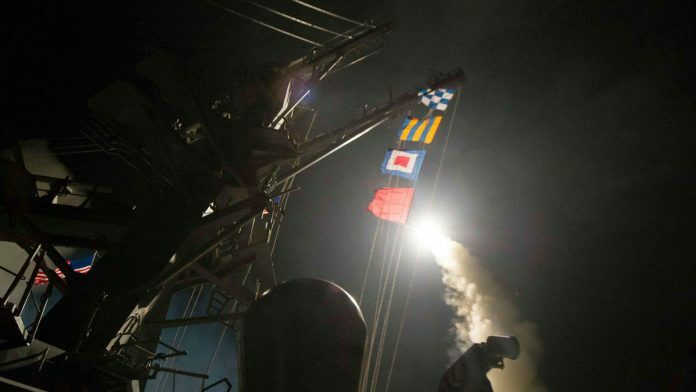 On the orders of President Donald Trump, two US Navy destroyers in the Mediterranean Sea fired 59 Tomahawk cruise missiles at Shayrat airfield in western Homs province at about 04:40 Syrian time (01:40 GMT). They targeted aircraft, aircraft shelters, storage areas, ammunition supply bunkers and air defense systems at the Syrian government-controlled facility, according to the Pentagon. It said the base was used to store chemical weapons and that “every precaution” had been taken to avoid casualties. The Russian military was informed beforehand, the Pentagon said. Speaking from his Mar-a-Lago estate in Florida, Mr Trump said he had acted in America’s “vital national security interest” to prevent the use of chemical weapons. Mr Trump branded President Assad a “dictator” who had “launched a horrible chemical weapons attack on innocent civilians” and called on “all civilized nations” to help end the conflict. What are they saying on the ground? Retired civil servant Mateea Zefa, living about 874yds from the base, went with his children to look at the base afterwards and found it “totally destroyed”, he told the BBC. Houses on one side of the base were also “totally destroyed”, he added. A nurse at Shayrat’s hospital, Ammar al-Khidr recalled being woken by “big explosions” at “around 03:30 or 03:45”. Some children and other people were injured by shards of breaking glass but no civilians were killed, she said. Syrian state media say as many as nine civilians were killed in the strike, four of them children. The BBC is unable to confirm this information. The Syrian army said there had been significant damage to the base. What is different about this strike? President Trump previously spoke out against US military involvement in Syria, instead calling for a greater focus on domestic interests. However, following the deaths in Khan Sheikhoun, Mr Trump said “something should happen” against the Syrian leadership, without giving details. US Secretary of State Rex Tillerson also signaled a sudden shift in policy on Thursday, saying that Bashar al-Assad should have no role in a future Syria. The Russia government is one of President Assad’s most important allies and its military has been targeting rebel groups in Syria, including jihadists such as so-called Islamic State, but also reportedly the more moderate Western-backed opposition forces. Dmitry Peskov, spokesman for Russian President Vladimir Putin, called the US strike “an act of aggression against a sovereign nation”. Mr Putin regretted the damage to US-Russia ties, as well as the “inevitable negative consequences” for the fight against terrorism, he added. The Russian foreign ministry said that, as a result, it was suspending a deal with the US that was designed to prevent clashes in the skies over Syria as the two countries wage different campaigns. Defences officials also said Syria’s air defences would be strengthened to protect key infrastructure. They added that many of the cruise missiles failed to hit their intended target. What do we know about the ‘chemical attack’? The White House believes the attack was launched from the Shayrat airfield by warplanes under the command of President Assad. It says the substance used was likely the highly toxic nerve agent Sarin. The Syrian military denied using any chemical agents, while Russia said an air strike had hit a rebel depot containing chemical weapons. What other reaction has there been to the escalation? The latest action was welcomed by Syrian opposition group the Syrian National Coalition, which called for further strikes in the future. Meanwhile, the UK government called it “an appropriate response to the barbaric chemical weapons attack”. Syria war: Reactions to the Strike on ‘Chemical Weapons’ Base. Russia reacted angrily after the US launched a missile strike on Syrian government air base.